If there’s one thing that’s inevitable about a European-dominated IFFP longlist, it’s that you’ll come across a few World War Two books sooner or later. Today we’re on a trip to Prague for the first of this year’s batch, a story about a man whose ambition may have outstripped his abilities. A French writer obsessed with the Czech Republic decides to produce a novel about the events of a WW2 assassination attempt. Reinhard Heydrich, Himmler’s right-hand man, has turned Prague into his own private police state, a model for other German ‘provinces’. Needing to show the British that they are pulling their weight, the Czech government-in-exile in London decides to strike a blow and sends in two parachutists (Slovak Jozef Gabčik and Czech Jan Kubiš) to bring down the ‘Blond Beast’. The subject matter is fascinating, and the story (on the periphery of major WW2 events) is an enthralling one. In addition to the depiction of a major villain I’d never even heard of, HHhH explains the background of the German march into Central Europe, including the animosity between the Czechs and Slovaks which may have made it possible in the first place. If you are going to write about the war, looking at a relatively unknown aspect of it is a good way to go about it. Despite the inherent interest of the story though, Binet is just as interested in telling us about his story, the writing of HHhH. The novel is written in a detached manner, with the writer constantly interrupting, and commenting on, the action he is attempting to describe. The novel is written in over 250 short chapters, many lasting less than a page, and it comes across as less a novel than an experiment in historical fiction, one which (as the writer seems to feel) is always doomed to failure. When he (the writer narrator) is obviously making things up, how can we trust him? And why should we? 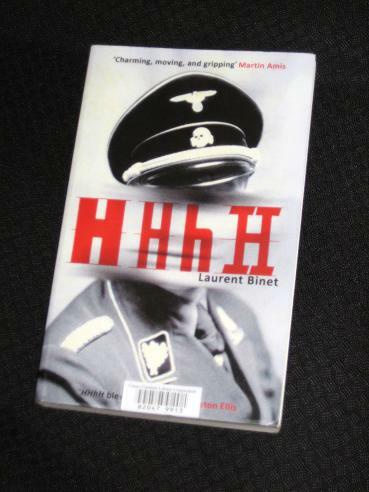 HHhH is an interesting book, but for me the interest is mainly due to the events Binet is describing, not his literary messings around. At times, the digressions and musings are simply frustrating, preventing the reader from making a connection with the story. Ironically, once we get to the main action of the novel, the one point where the story takes over, it is all a bit of a let down. I suspect that the earlier messing around was disguising the fact that there’s nothing particularly appealing about Binet’s writing. Seriously, I’m not saying that this is bad – it’s an interesting read, and Binet does get it right in places. It’s just that a lot of the interest comes from the subject matter and not the way the writer handles it. Of the ten longlisted works I’ve read so far, this one is my least favourite. It’s not bad, just not good enough. I've read quite a few reviews of HHhH. All of them very fulsome in their praise, especially here in Spain. But this is the first one I've read that tries to be more nuanced. Before reading your review I would have said it was a book I would buy. Now I'm not so sure. Thank you, you've given me a lot more to think about. Your review pretty much sums up what I thought of the book without having read it… I may get round to it eventually but I'm in no hurry. Sounds like just the kind of novel that would irritate the hell out of me. Plus, I'm already very familiar with the story of Reinhard Heydrich. I can imagine how it would appeal to a certain type though. Well I must be the 'certain type' described above. I have to say that I disagree with you, here. I'm not a big fan of historical fiction, in fact I find the genre suspect most of the time for just the exact reasons Binet describes in the passage you've quoted. It's made up. How can anyone know the details historical novelists describe as 'true'? I also found the meta-narrative just about as compelling as the 'historical' story Binet was telling. I think it's a mistake to read the narrator and Binet as one in the same person. The narrator is always a 'voice' if not a character; here I found him to be a character. I enjoyed the tension between the narrator's desire to tell the truth and to give his characters a happier ending than they really had.Finally, I'd have to say that I found HHhH to be a fresh, original book, at least not like anything I'd ever read before. I've read a lot, quite a lot. It was very nice to find something new under the sun.Still, thanks for this review. I enjoyed it, even if I did disagree. I can't speak to how well it compares with the other books up for this award, but I'll certainly be looking for more by Binet. This is a book that was already on my radar before IFFP due to the disparity of opinion on it. So regardless of whether it makes the cut I'll probably read it, just not sure when. literarytaste – While I've read some praise, there have been dissenters too 🙂 This wasn't for me, but many people (including one comemnting later in the thread) enjoyed it a lot. Thanks for an honest review Tony. I am curious about this book, probably read it at some point too. Can't wait to hear what you think about the Turkey book next. Ha Ha Ha Ha!! Love it! As you know I LOVED this book. I think this is meta fiction at its best and I found the story and his musings equally interesting. I agree with everything CB James says. This book should be commended for its originality, the way it pushes the boundaries for new writing etc. I really hope your fellow jury members vote this to the top.